Here's yet another of our strange items, along the lines of the NOTHING items. This one, however, can't be acquired by simply editing a saved game. Produced accidentally, this oddity may be nothing more than a symptom of a bug in the game code. Since that appears to be the case, I can't say for certain that anyone else will ever see it. Fortunately, I took screenshots. This time, instead of a typical item, the town of Mile has become an item. Wow, I wonder how you carry a town around. A word of warning. 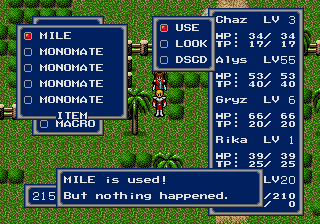 If you get Mile as an item somehow, attempting to use the "Look" command will crash your game. 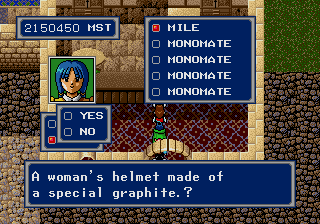 Using the item, on the other hand, seems perfectly okay. You can't use it in combat, however. In fact, if you get into a battle, Mile will disappear from your item list, an Antidote will be placed at the end of the list, and your Meseta will get a hefty boost. Look at the fourth image to see how hefty. That has all sorts of strange connotations, doesn't it? If you make it to a town without getting in a fight, however, you can sell Mile at the local shop. After several tries, I managed to walk from Molcum to Krup without an enemy encounter. According to this Krup shopkeeper, Mile is a hat. Hey Rika, want to wear Mile for a while? Mile is also loaded, it seems. 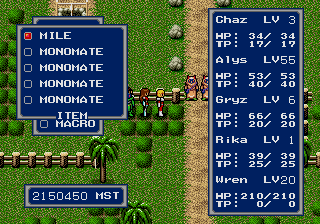 Notice the amount of Meseta the characters have in the above image: 2, 150, 450. 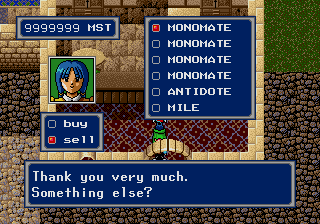 Selling Mile resulted in the maximum amount of 9, 999, 999 Meseta, as shown below. How's that for fast meseta? ;) And look, when Mile was sold, an Antidote appeared in the item list, along with another Mile. The second Mile appeared to be a duplicate of the first, with all the same behaviors. Chaz Ashley, Algo's first real estate agent.